Valie was an Altmer thief hired by Sulla Trebatius to be part of his ill-fated expedition into Alftand ruins. In Sulla's expedition manifest, he mentions hiring her specifically because she was a mage not associated with the College of Winterhold. According to J'zhar's journal, the expedition group suspected that his brother J'darr caused Valie's disappearance, though he believed otherwise. 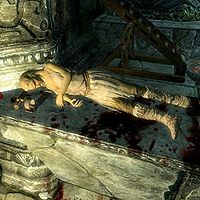 Her corpse can be found within the Animonculory zone of the ruin in the main Falmer campsite, on the torture table in the bottom room. Sadly, it seems she died after being captured and tortured by the Falmer residing there. Valie can be found wearing some ragged robes with matching boots. This page was last modified on 27 January 2016, at 21:00.